Welcome to the second season ladies and gentlemen. Just because the regular season is over does not mean the fantasy fun ends. Playoff pools are becoming more popular than ever. So what are we going to do first? Honestly it is time to give you “The Good, The Bad, And The Ugly”. Somewhere Clint Eastwood may sue us for royalties. Who saw this coming but it cannot be all explained off by Dale Hunter finally getting the Capitals to buy into a system. The bottom line is Holtby has given up TWO goals in the postseason so far in games that have gone to OT (1 win, 1 loss). The Caps goalie has faced the far better chances as opposed to Tim Thomas. Young players do have a history of coming in and setting the world on fire (Patrick Roy and Jean Sebastien-Giguere). Holtby also has a .973 save percentage going into tonight. Yes he gave up four tonight but honestly it was just one of those games. Giroux started off a little slow but then burst apart the world with a six point Game 2 performance against the Pittsburgh Penguins (3 goals, 3 assists). Overall, Giroux has 4 goals, 4 assists, and a +5 in the three games against Pittsburgh. 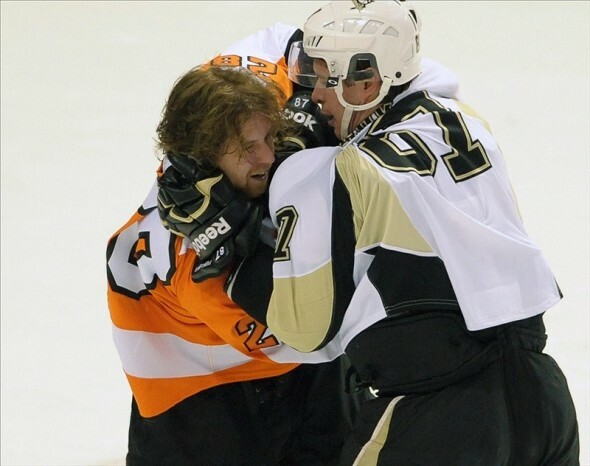 Giroux with the help of Jaromir Jagr and company has played far more disciplined than Sidney Crosby and company. That has been the biggest difference in a series that had many thinking it would be 2-1 Pens instead of 3-0 Flyers. Giroux is a major reason why as his leadership and production have rubbed off. Not many expected Tim Thomas to be in a dogfight against the Capitals with another goalie but he has matched his counterpart almost save to save with a 1-1 record, 0.83 GAA, and .965 save percentage. Thomas has had to make some high quality saves but Holtby has gotten the headlines because of his age and “newness” if you will. Game 3 tonight will definitely be a key as Thomas goes to Washington. This may be a series changer for one of the goalies. We were right on tonight’s potential as he did give up three goals. Little of that matters in the W column. Here is what you need to know. Zero goals on 12 shots and seven scoring chances describes Parise’s postseason so far. How about some added insult to injury? Your captain should be composed, yes. However, when you, as a Captain, do not show some anger in your ability to finish and lead your team out like a bunch of zombies, that is a problem! Game 3 better see a better Parise or New Jersey is really in some trouble. This may be a bit unfair but the Canucks I saw last night by all rights should have won Game 3 over the Los Angeles Kings. However, the Canucks found ways not to score as opposed to putting pucks in the net. No goals of support for Cory Schneider masks the fact that Alain Vigenault had to make this move in the first place. Roberto Luongo could not make the critical stops in Game 1 and Game 2. There were times he looked very good but too many times where he did not. The fact that Luongo and even a guy like Henrik Lundqvist still probably plays too deep in the crease, it is a problem. Does Luongo even see the ice in Game 4? That is a question that truly does not have an answer. However, fan opinion seems to suggest more Schneider than Luongo. It was one that is hard to believe but fantasy ugly does not go to the Vancouver Canucks. It goes to the Penguins who are down 0-3 and look nothing like the team they were over the second half. Sidney Crosby has a few points, so does Evgeni Malkin but the breakout games have not happened. There are no Penguins in the scoring leaders and Marc Andre-Fleury has a 6.34 GAA and .798 save percentage. Dan Bylsma has no answers as his team has been suckered right into the hole and they cannot get out. Fantasy wise the only way the Penguins are going to climb out of this is together, otherwise Game 4 will be their last. There is something about these two together that could spell trouble for many opponents. Whether Florida has a deep run in them is another question entirely but these are two players that can deliver unexpected results. Goc is more the passer and Bergenheim the scorer but clearly their chemistry is something that cannot be disputed. While New Jersey concentrates on the “VFW line”, this duo may be the one that does them in if not careful. Boyle is the type of player that drives opposition nuts but has some deceptively pretty good hands. Combine that with a 6 foot 7 frame and you have a guy that can do some damage come playoff time. Sure enough, he has three goals in three playoff games for the Rangers. For those who thought maybe we should include Danny Briere on this list, Boyle was a better choice because Briere is too much of a proven commodity come playoff time. There is something about Laich that screams playoff ready. He scored off a nice play tonight where he caught everyone on Boston napping. Laich can play offense or defense and has been used in both roles this year. He also sees some extensive special teams time which helps foster scoring chances as well. If you are really desperate, he may just be a player you want to invest in even if Washington does not go too deep in the playoffs. The Blues may not always score a ton but McDonald just adds something so undeniable. He is a pivot who can make an entire line and power play unit that much better. His only question has been health and that injury history really is well documented. However, his potential production is just too good to pass up as the other more well known names are gobbled up in pools. One could do much worse. That is it for now and next week we will even add in a few injuries of note into the mix. Good luck in your fantasy playoff pools and thanks for reading.